Jobs for Nevada’s Graduates (JAG Nevada), a nonprofit agency that partners with public education and private agencies to develop high school students into the talent employers want to hire using education and skills training, is helping its students make a stellar first impression in front of prospective employers by seeking donations for the third annual JAG Nevada Career Clothing Drive. The drive will kick off on Giving Tuesday, November 27, and run until January 31, 2019. JAG Nevada is collecting new and gently-used professional clothing of all sizes for male and female high school students. Items needed include: pants, dress shirts, ties, blouses, skirts, dresses, shoes, sweaters/cardigans, jackets, jewelry, belts, underwear (new only), and socks (new only). 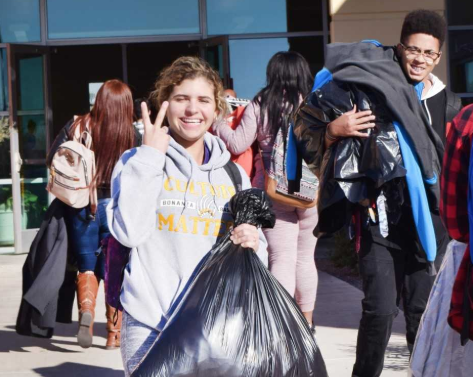 Clothing and items collected will be offered to students at the “JAG Boutique” at JAG Nevada’s annual Career Development Conference, which will be held on April 29, 2019. Students from JAG programs across Nevada take part in individual and group competitions focusing on Employability Skills, Critical Thinking, a Quiz Bowl, Problem Solving, Chapter Displays and PowerPoint presentations. A college/career fair and a variety of workshops round out the conference. Drop off locations for the JAG Nevada Career Clothing Drive can be found at www.JAGNV.org or call 702-410-8078, or email info@jagnv.org. Businesses interested in making a bulk donation or to host an in-house company drive, please contact Patricia Andrews at jagoffice@jagnv.org.